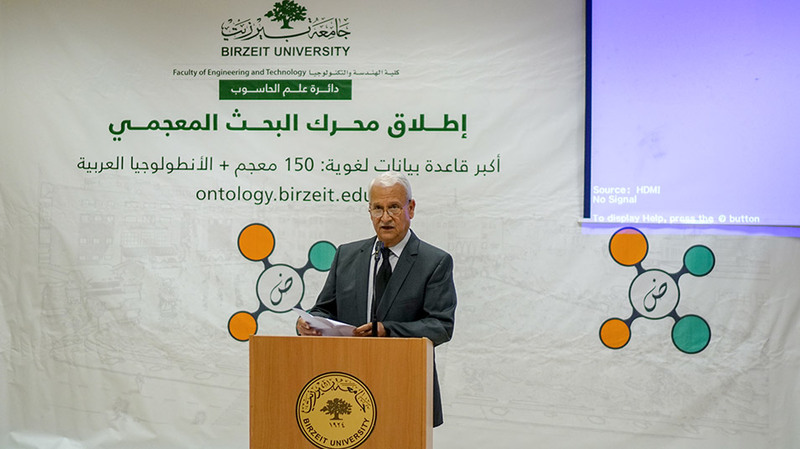 Birzeit University launched a linguistic search engine with 150 multilingual lexicons and a linguistic ontology for Arabic, on Tuesday, September 25, 2018. The launch ceremony was attended by University President Dr. Abdullatif Abuhijleh, Deputy Undersecretary of the Ministry of Education Dr. Ihab Qubbaj, President of the Palestine Academy for Science and Technology Dr. Marwan Awartani, Secretary General of the National Commission for Education, Culture and Science Murad Sudani, and UN-ESCWA’s Chief of Innovation Dr. Nibal Idlebi. The search engine contains the world’s largest Arabic lexical database, which is a non-profit, long-term research project that aims to provide people with an innovative tool to find translations, synonyms, and definitions in all domains and disciplines. The Arabic ontology, which is a classification and a tree of the meanings of Arabic terms, is based on state-of-the-art science, rather than the native speakers' knowledge as in dictionaries. Abuhijleh stated that this achievement demonstrates the university’s leading role in science and innovation. 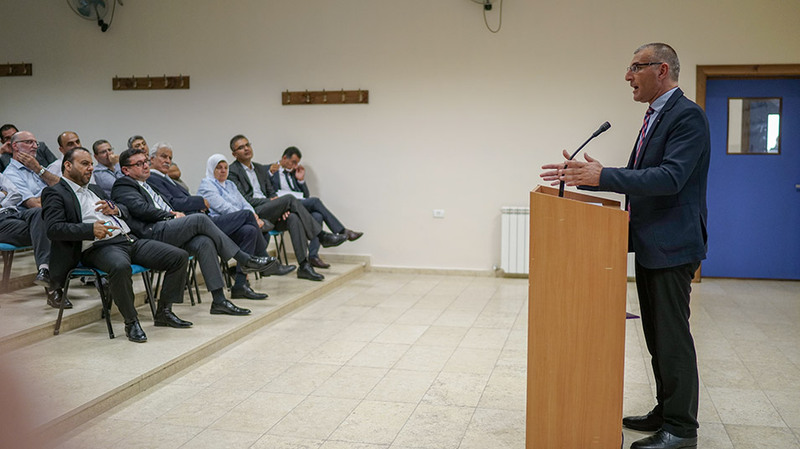 He explained that by digitizing this huge number of lexicons – despite the limited resources – Birzeit University has realized an old dream for many Arab organizations to digitize and preserve Arabic lexicons. Abuhijleh congratulated the computer science department and the leading faculty members for their pioneering efforts to serve their community’s needs. He noted that he expects this huge linguistic database to also serve modern IT applications. He also emphasized the need for regular research calls that should be initiated by the government in order to allow Palestinian scientists to contribute to national needs and the economy. Dean of the Faculty of Engineering and Technology Dr. Wasel Ghanem expressed his pride on the occasions of this achievement, in addition to the other scientific achievements that his faculty and the computer science department are making, including the digitization of the Palestinian dialect to enable machines to understand and process text written in this dialect. He commented that technological advancements, such as the one presented in the ceremony, are the wheels that drive the economy forward, and remarked that such efforts help apply research studies on the ground and facilitate Palestine’s integration into the fourth industrial revolution. 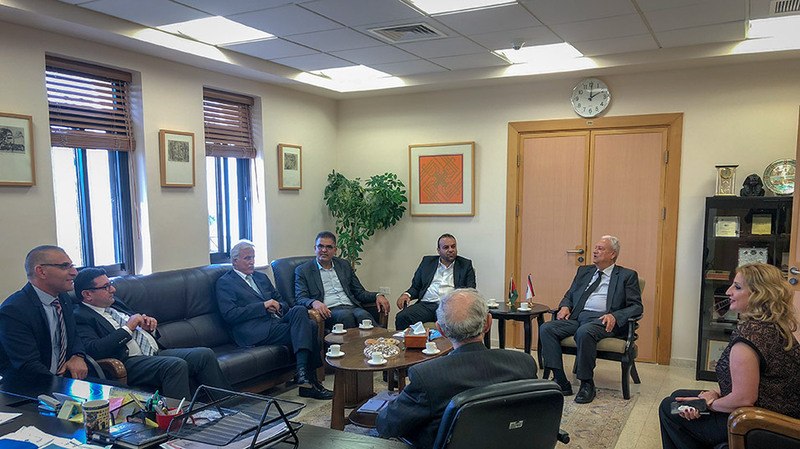 Qubbaj said that we are witnessing an important scientific contribution, which reflects Palestinians’ capabilities and innovation despite the absence of resources and funding. He stated that the ministry is working very hard to revise and improve the quality of education, and that efforts are underway to spread awareness on the search engine and the Arabic ontology for use in academic settings. Awartani acknowledged the role of Birzeit University in science and innovation, even with very limited funding. He explained that the importance of this search engine is not only in serving the Arab community, but also in improving modern IT applications. He added that the absence of such linguistic resources has led to poor applications, which the public uses in its daily life. Awartani also explained that the current internal reform of the academy will enable it to be the voice of Palestinian scientists, and that it is conducting several programs to enhance the skills of young researchers. He said that development can’t happen without encouraging the young minds of Palestine, both locally and abroad, to conduct research. Emphasizing the role of commercializing research, Awartani added that funding can be fed back into the research efforts, which would provide a boost for research and development in Palestine. Sudani expressed his appreciation of this historic achievement and acknowledged that digitizing lexicons in this way does not only help preserve the Arabic language, but also serves as a renovation process to face the modern explosion of information, big data, and globalization. Sudani noted that the project has a lot of potential for the future, and pushed the creators for more efforts in expanding its reach. Idlebi stated that the project is one of most significant pushes to improve Arabic language content on the internet. She presented statistics comparing Arabic and other languages, and explained that the number of Arabic-language webpages is only 0.6% of the total, although 5.7% of the world’s population is Arabic-speaking. She also highlighted that most search engines on the web don’t take into consideration the innate characteristics of the Arabic language when handling web content. Idlebi also called on Arab researchers to pay greater attention to producing quality Arabic content on the web, as such content would assist in the development of IT applications, and improve the Arab world’s economies and facilitate their transformation into information-driven models. Dr. Mustafa Jarrar, inventor of the linguistic search engine, explained that although the engine is the first of its kind in terms of the quality and quantity of linguistic information presented, the launch is the first phase of a bigger project. He added that he aims to build a comprehensive linguistic data graph, which will include syntactic, morphological, and semantic features, as well as linking these to other languages to better equip the IT industry with the resources that they currently miss. Jarrar demonstrated that the Arabic ontology is represented in logic and as such can be understood by machines and used in modern applications, such as semantic information retrieval, machine translation and semantic disambiguation, big data and information integration, the Semantic Web, and others. He noted that the ontology presents a new methodological paradigm in lexical semantics and lexicon engineering.